Americans loosened their purse strings substantially during the traditional post-Thanksgiving shopping frenzy, giving retailers and online selling sites such as eBay and Amazon something to be thankful for. Experts anticipated shoppers would spend more in December than they have in recent months, but less than last year. Yet to the surprise of many, millions of shoppers logged onto their computers on Cyber Mondaythe official start of the online holiday shopping seasonlooking for bargains and increasing online business traffic by 30 percent, according to Integra Telecom Inc., an integrated communications carrier for business. "Holiday sales are not expected to continue at this brisk pace, but it is encouraging that Americans seem excited to go shopping again," notes Tracy Mullin, CEO of the National Retail Federation. 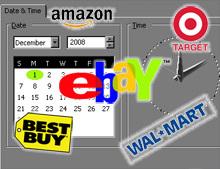 In fact, online bargain hunters seemed eager to buy, spending $846 million Monday, reports comScore Networks. The average shopper spent $372.57 on a day that saw overall online spending rise 15 percent compared to the same day a year ago. eBay's PayPal subsidiary saw a 26 percent increase in sales on Black Friday, the day after Thanksgiving. eBay itself had higher sales than expected, and was the top retail destination for bargain hunters, according to the Nielsen Online Holiday Shopping Index, with nearly 10 million unique visitors. The hottest item on the site was the Nintendo Wii console, with 3,171 consoles sold that day. Amazon also did its best to get buyers, slashing prices by 50 percent or more on some electronic gadgets and software. Amazon saw "heavy traffic" Monday, according to the company, even though its busiest selling period is typically the second week of December. As Christmas nears, online merchants are hopeful that the enthusiasm seen early in the holiday shopping season will continue. "For most retailers that we speak to, online still remains kind of their bright spot," says John McAteer, Google's retail director, in a news report. "They understand the sphere of influence is much broader than just a click." Encourage bidding frenzies with incentives for your buyers.